We LOVE to mix up our breakfast options with as many savoury AND sweet recipes with under our belt as possible! Keeping it simple, healthy, fresh and with a hidden vegetable and our organic green tea matcha powder is something we always try to tick off and kick-start the day with. This one is awesome in terms of ticking all the boxes, especially for mothers/fathers with kids to feed, lunches to pack and drop-offs to do, a healthy and find that making a nutrient packed breakfast isn’t ALWAYS easy. 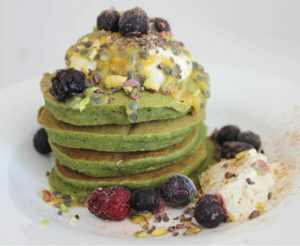 These mildly sweet (with natural sweetener, banana), super tasty yet extremely healthy buckwheat, matcha pancakes are AMAZING to not only make in the morning, but also store in the fridge overnight for a quick brekkie set up! They’ve got secret ingredient, SPINACH, and secret healthy sweetener, BANANA, to mask the #healthiness of the pancakes. It’s perfect for those who are coeliac, trialling a refined sugar free diet or those who follow a paleo based diet! We know and love our matcha family enough to appreciate that MANY of our Matcha Maiden mates enjoy living a health conscious life which is why we opted to make all of our Matcha Maiden blends completely certified organic. Our matcha uses organic green tea which is recognised by the Japanese Agricultural Standards (JAS) which is also Australian certified organic (YAY). Our matcha have no fillers such as sugars, sweeteners or milk solids and are as pure as you can get (ALSO YAY). When bubbles appear on the surface, flip and cook until lightly brown on the under surface.